The IDF has released an aerial map of Lebanon revealing the location of some 1,000 different military sites and facilities. The map was published on Wednesday in the Washington Post. 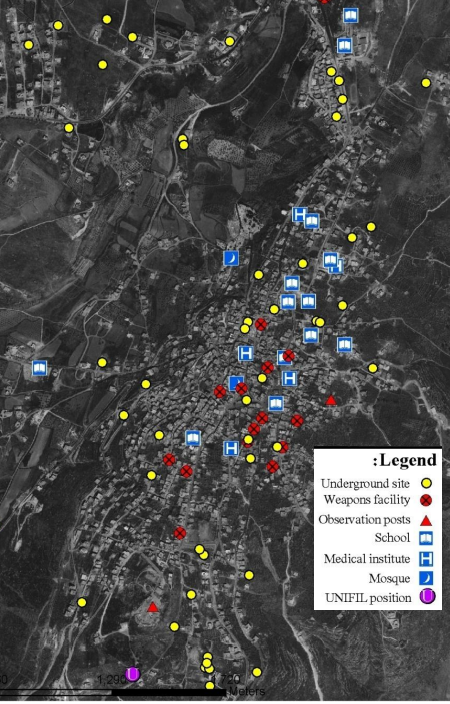 According to the map, which the newspaper said it obtained from the Israeli military, Hezbollah has around 550 underground bunkers throughout Lebanon, around 300 surveillance sites and another 100 or so additional installations. But the actual report in the Washington Post only mentioned this important story peripherally, buried in a story about how Israel supposedly might prefer Assad stay on as leader of Syria. Today, after other news outlets picked up on the story, the Washington Post ironically has the story as a headline - but based on an AP report, that was based on the JPost report, that was based on the WaPo report that was buried! Many of the sites on the map are located south of the Litani River in Lebanon, the zone where Hezbollah is banned from keeping weapons under the U.N.-sponsored truce that ended Israel’s summer 2006 war with the guerrilla group. This seems like something that the UN, especially UNIFIL, should address, right?